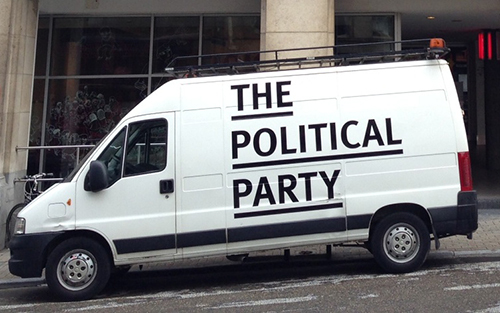 In 2012, artist, curator and writer Michiel Vandevelde initiated the ongoing project ‘The Political Party’. ‘The Political Party’ isn’t a real political party, it is a think tank questioning Western democracy and reflecting upon alternative ways of doing and thinking politics. This initiative roots in deep concerns around the fragmentation and impotence of public discourse in the west and the inability for political imagination and action that comes along with it. The core question is how we can challenge hegemonic political ideas around the current economic, social and political organization of western society? What other kinds of social, political, economic paradigms can we imagine? ‘The Political Party’ manifests itself in different ways among which a driving library with a selection of political and philosophical books. 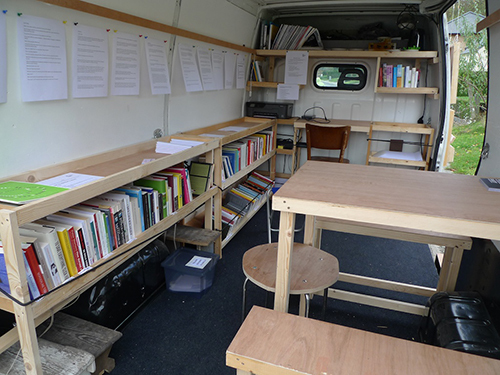 The driving library has been travelling throughout Europe since 2013 both on formal invitations and through informal manifestations. The library aims to be a space for the deepening and exchange of knowledge and political imaginaries. During Kunstenfestivaldesarts the van will travel along with the mobile festival centre. It will be a place where one can browse through the books as sources of inspiration, and each weekend there will be a reading session, where one article will be read together, thus activating the social and political function of the library.